It’s always a good time to make these low-carb keto pumpkin cookies. If you’re a pumpkin-chocolate fan, you are guaranteed to LOVE these! This is a great recipe to try if you’ve been thinking of grabbing a copy of the new Ketogenic Dessert eCookbook. The new eBook is full of easy, keto dessert recipes like this one! Includes cakes, cupcakes, brownies, cookies, and even a bonus section of comfort food recipes like pizza crust and bagels. Click here to check it out! Preheat oven to 350 degrees F, and line a cookie sheet with parchment paper. In a large bowl, combine pumpkin, softened butter, cream cheese, egg, and vanilla. In a separate bowl, combine the dry ingredients: almond flour, erythritol, pumpkin spice, baking soda, and salt. Pour the dry ingredients into the wet ingredients, and stir until combined. Fold in the chocolate chips. Drop heaping tablespoons of dough onto cookie sheet, and flatten a bit as the cookies will not spread a lot while baking. If you want the outside of the cookies to be perfectly smooth, use slightly damp fingers to smooth them out. Bake for about 12-14 minutes. Allow to cool, and enjoy! *Feel free to use any granulated sweetener of choice if you do not need this recipe to be keto. **My keto chocolate brand of choice is Lily’s Sweets – I either use their dark chocolate baking chips, or their milk chocolate bar chopped up. Tag me on Instagram and use #baketobefit if you try this recipe! 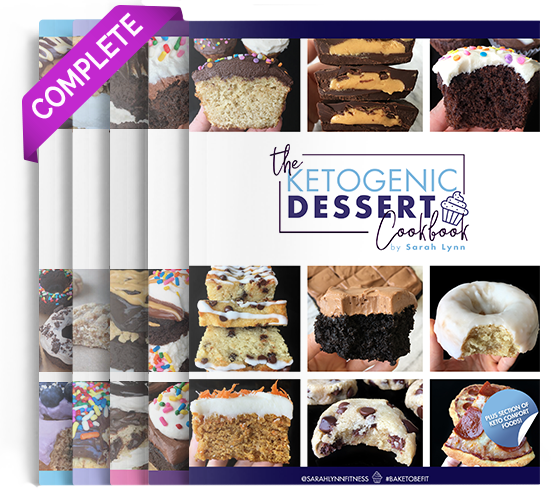 For tons more keto dessert recipes, check out my new Keto Dessert eCookbook – available now! 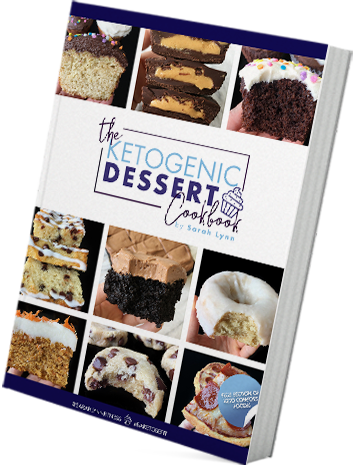 The Ketogenic Dessert Cookbook is HERE! 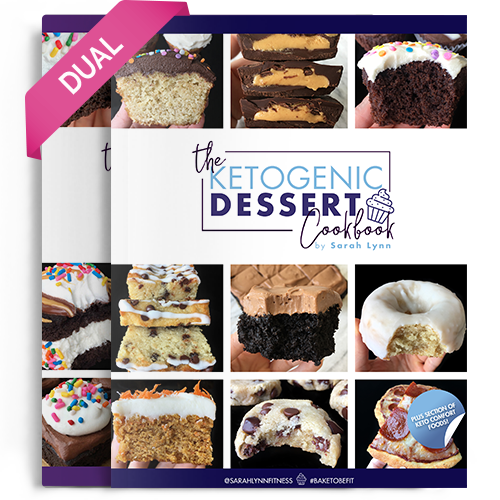 It’s the moment we’ve all been waiting for: The Ultimate Book of Keto Desserts is AVAILABLE NOW!!! Check it out here. Q: Do I need to follow a strict keto diet to enjoy this book? You can even make the recipes using regular sweeteners/sugar if you don’t need the recipe to be keto. Q: What type of ingredients do the recipes use? 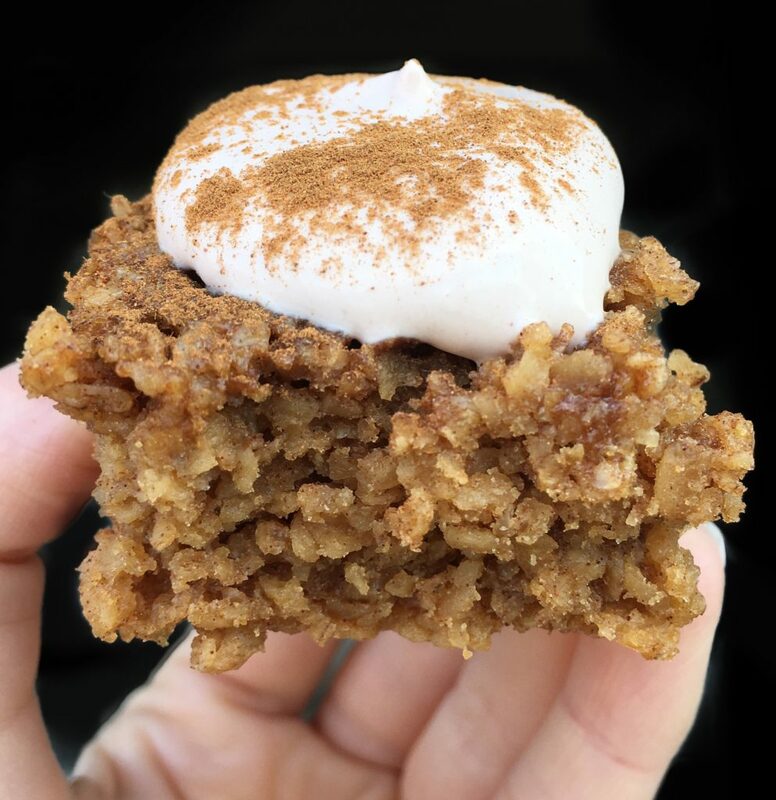 A: The recipes use ingredients such as almond flour, coconut flour, coconut oil, cocoa powder, erythritol (or sweetener of choice), cream cheese, ricotta cheese, grass-fed butter (or dairy-free alternatives), eggs, sugar-free chocolate, pumpkin, baking soda/baking powder, salt, etc. All of the ingredients are widely available and can be found in most grocery stores. Q: How does this book differ from the other eBooks? A: This book is optimized for the keto diet, so it is higher in dietary fats, very low in carbohydrates (average of 1g net carbs per serving in each recipe), and moderate in protein. Due to the higher fats, these recipes taste even more indulgent and have incredible texture. The recipes in the other books are lower in fat, slightly higher but still quite low in carbs, and higher in protein. Anyone can definitely enjoy all of the books as part of a healthy diet, but some may be preferred if you tend to follow a specific diet. Q: Are the recipes vegetarian friendly? A: Yes! The recipes are all lacto-ovo vegetarian and do not use any form of collagen protein or other protein powders. The recipes may not be suitable for a vegan diet as they do use eggs. If you have any additional questions, don’t hesitate to contact me! Thank you all for your support of the new book so far, the positive response and feedback so far has been INCREDIBLE! I plan to have the new book done in time for the holiday season this year! 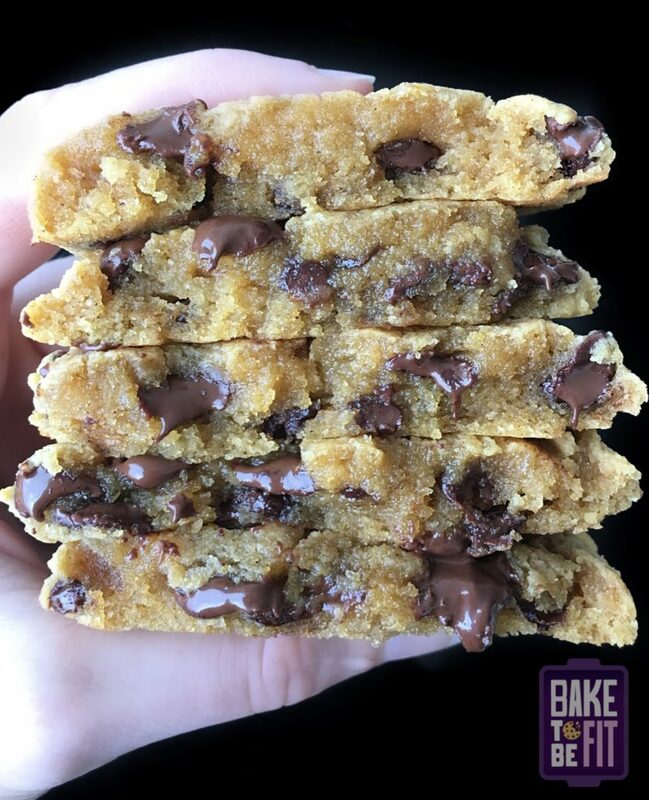 In the mean time, here’s a keto “brookie” recipe as a sneak preview. 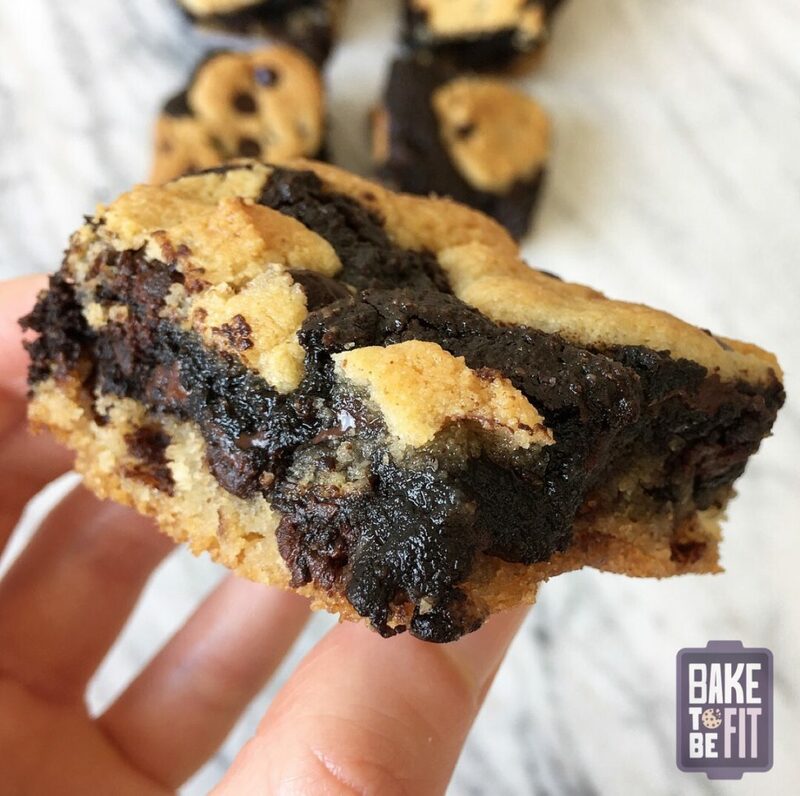 This combination of a fudgy, gooey brownie and chewy chocolate chip cookie is sure to please everyone in the room, and no one will believe they’re keto! I HIGHLY recommend trying these delicious brookies, whether you follow a keto diet or not. After posting this recipe on Instagram as a collaboration with Lily’s Sweets Chocolate, it was such a hit that I had to post it on the blog as well! *Note: do not replace almond flour with coconut flour. Coconut flour is very absorbent, and will make the brookies extremely dry if used. All flour substitutions must be made at your own risk. **Note: non-impact carbs from erythritol are not included in nutritional info. If you do not need these to be ketogenic/sugar-free, feel free to use any granulated sweetener such as coconut palm sugar, cane sugar, etc. and regular chocolate chips. Grease or line an 8×8 square pan with parchment paper. Start with cookie layer: combine dry ingredients in a large bowl. Add butter and stir until distributed. Add egg and vanilla and stir until combined. Fold in chocolate chips. Spoon about 2/3 of the cookie dough into the bottom of the pan. Use wet fingers to spread dough evenly over bottom of pan. Follow same instructions as cookie layer to assemble brownie ingredients. Spoon brownie batter into the pan, and use either the back of a spoon or wet fingers to spread brownie batter evenly over cookie dough. Take remaining 1/3 of cookie dough and distribute randomly on top of brownie batter. I formed the remaining dough into circle shapes to keep some brownie peeking through. Allow to cool, slice, and enjoy! Tag me on Instagram and use #baketobefit if you try this recipe! Check out the new Keto Dessert Cookbook for tons more ketogenic dessert recipes like this one – it’s available now! Click here to check it out. These bars are gluten-free, dairy-free, refined sugar-free, with added collagen protein for hair, skin, nail, and joint health. They make your house smell amazing while baking, and they’re a perfect make-ahead breakfast option. Try boosting them with any add-ins you like – spices (cinnamon, ginger, nutmeg, cardamom), ground flaxseed, brain octane/MCT oil, collagen, maca, etc. Give them a try! They only take about 30 minutes from start to finish, including baking time! Preheat oven to 350 degrees F and line an 8×8 inch pan with parchment paper. Add all dry ingredients to a large bowl and stir. Add wet ingredients and whisk until combined. Spread batter evenly into pan, and bake for 20-22 minutes or until slightly firm in the center. Enjoy warm or cold! Pictured here topped with dairy-free coconut yogurt and cinnamon. These gluten-free fudge brownies are super indulgent, yet still free from refined sugar, wheat, gluten, and dairy. They will remind you of your favorite boxed brownie mix, and they’re just about as easy to make! These brownies are a bit higher in calories (*although still much healthier than traditional brownies and perfect for a treat) than the recipes found in my eBook, The Healthy Brownie Cookbook. 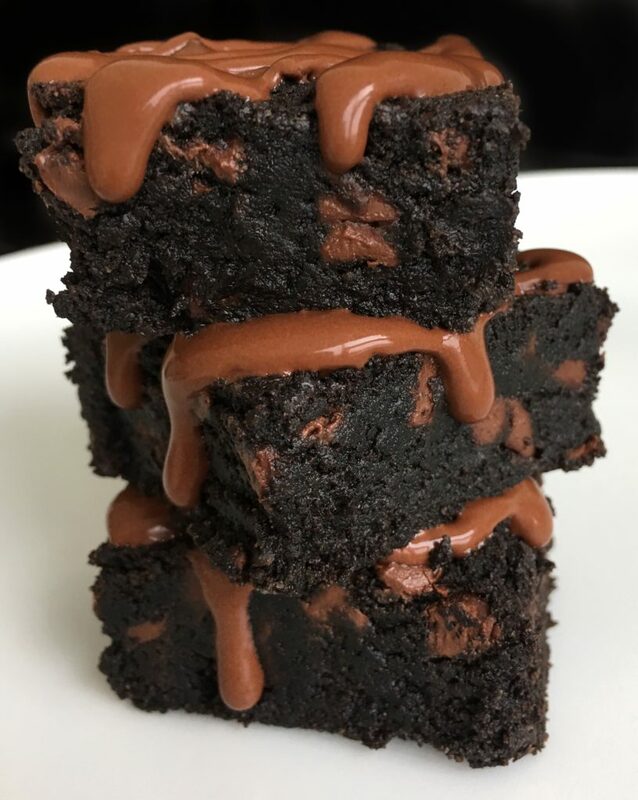 The brownie recipes in the book are very low in calories, high protein, low sugar, while still managing to have rich flavor and super fudgy texture. Check out the eBooks here for more information! Preheat oven to 350 degrees F. In a large bowl, combine all dry ingredients. Add melted coconut oil, and stir until distributed throughout dry ingredients. Add eggs and vanilla extract and stir until combined. Fold in chocolate chips. Line an 8×8 inch square glass pan with parchment paper, and spread batter evenly into pan. Bake for 18-20 minutes. Allow to cool completely before slicing and serving. Tip: hover cursor over the photo, or tap photo on mobile to pin this recipe to Pinterest! **for a refined sugar-free, dairy-free chocolate chip option, use 1 chopped up Eating Evolved 72% or cashew milk chocolate bar. Use code SARAH for an extra free chocolate bar with any order. Post a photo on Instagram and use #baketobefit if you try this recipe!